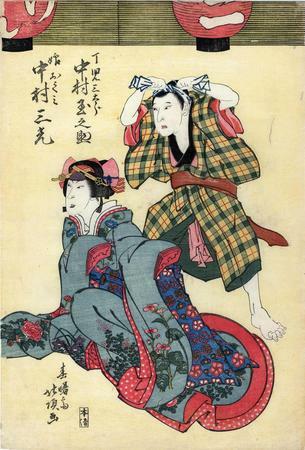 The actors Nakamura Sankō I (left/seated) and Nakamura Tamanosuke I (right/standing) playing the roles of Okumi and the decchi Santarō in the drama "Sumidagawa Gonichi no Omokage", which was staged in the 4th lunar month of 1827 in Ôsaka at the Kita-Horie Ichi-no-Gawa Shibai. Special care was used in creating the image of Okumi. If you click on the image and then enlarge it you will see that her white collar of her under-robe is embossed with a pattern of interlaced monji or swastikas, a symbol of good in Asian cultures from India to Japan. The light pink material in her hair appears to be embossed, too. Her lower lip is colored green, the fashion of that day which was meant to enhance the beauty of the wearer. It is called sasabeni (笹紅) or 'bamboo grass rouge'. A true fashion statement.